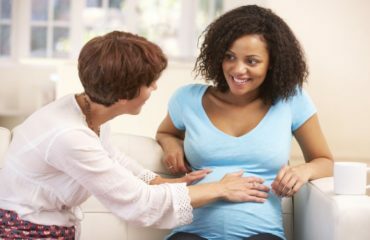 A positive pregnancy test means so much more than just the imminent arrival of a gorgeous new baby – it can leave you feeling like you’re going to burst with excitement, desperate to share our ‘secret’ and of course, with a hundred and one questions about what the next nine months will involve. Although you might not feel pregnant, your body is producing bucket loads of pregnancy hormones, and your baby is growing faster than it will at any other time of your pregnancy. All this at just two weeks along! How exciting. At just 4 weeks your growing baby is around 3mm long! That’s not much bigger than a poppy seed, but there is plenty of going on! At 5 weeks, your baby and their heart, brain and spine are developing at a fast pace. Soon the heart will start beating. At around 6 weeks their heart is changing from a simple, single tube to a complex four chamber organ, which will pump blood around their tiny body. How amazing! At around 8 weeks your little ones organs, nerves and muscles are all starting to function and although you won’t be able to feel it, there tiny heart is beating strong. At around 10 weeks this little person is at the most critical stage of their development which is now complete. 12 weeks the final week of your first trimester, and your baby has changed beyond all recognition from week one!! Your tiny baby is compact and fully formed, the next stage of their development is now to grow larger, it is likely you’ll see your baby for the first time soon with your first scan. It’s important to tell people when you ready, and not before. You might want to share the news with close ones, such as parents, you can keep it close and they will supportive through the journey. And besides, it helps to have someone outside of yourself and your partner to share the excitement with! Congratulations on your first trimester!